Collins 32S-3A is a highly flexible transmitter covering all the amateur bands between 3.4 MHz and 30.0 MHz. The 32S-3A is rated for a nominal output of 100 watts and power input to the final amplifier is rated at 175 watts PEP on single sideband and 160 watts on CW. Simplified controls on the 32S-3A make tuning quick and precise. Front panel controls are: Power/MIC GAIN, CW CAL, FREQ CONTROL selector, EXCITER TUNING, BAND switching, VFO tuning, P.A. TUNING and LOADING, EMISSION mode selector, and a METER switch which selects between ALC, P.A. Grid and P.A. Plate. The extra large, finely calibrated VFO dial provides that extra measure of confidence when operating near the edges of the amateur bands while the VFO tuning mechanism itself is shaped to fit the hand and is designed to minimize mechanical backlash. The 32S-3A can also be adapted for RTTY operation because of the high degree of stability of the unit. For RTTY, the 516F-2 Power Supply and a source of external cooling air should be used. Grid block keying for CW with adjustable keying characteristic from "soft" to "hard" is provided. 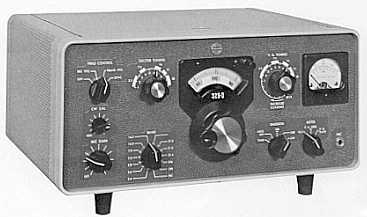 The 32S-3A comes equipped with the crystal sockets, crystals and bandswitch positions for eleven 200 kHz bands. 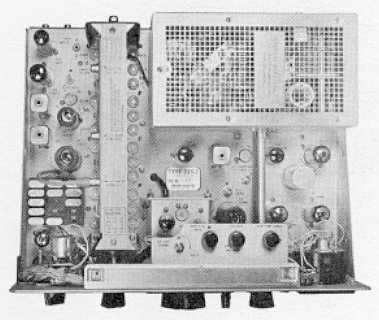 Crystal sockets and bandswitch positions are also provided for two additional 200 kHz bands between 28 MHz and 30 MHz. A fourteenth position, corresponding to the WWV position on the receiver, can be used for an additional 200 kHz band in the 9.5-15.0 MHz range, if desired. Regulation of oscillator voltages insures high frequency stability. An additional crystal board permits use of up to 14 additional crystals to provide general coverage of non amateur frequencies. Front panel selection of receiver VFO or transmitter VFO provides optional transceiver operation at the flick of a switch when using the Collins 75S-3C receiver. 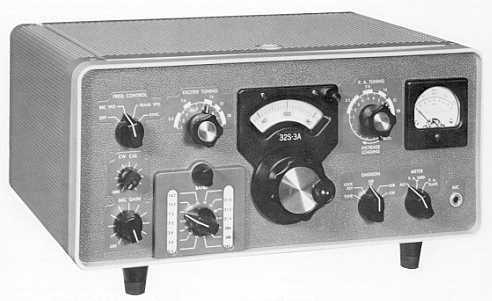 While the 32S-3A provides ample RF power for excellent communication, it can be used without modification to excite the Collins 30L-1 or 30S-1 Linear Amplifier. 10 meters: 28.5 - 28.7 MHz. With optional crystals, any 200 kHz range can be tuned from 3.4 to 30.0 MHz (except 5.0 to 6.5 MHz). SSB (either sideband selectable), CW or RTTY with 516F-2 Power Supply and external cooling air. SSB continuous; CW 50% duty cycle. Power can be delivered by an external supply such as the 516F-2 which must furnish 800 vdc at 230 ma; 285 vdc at 175 ma; 6.3 v at 6 amps; and from -55 v to -80 vdc with no current requirement. Heater supply may also be 12.6 v at 3.0 amps or 25.2 v at 1.5 amps. With the 546F-2, power consumption is approximately 130 watts in standby; 400 watts in full lock-key; and 270 watts in normal voice transmit. 175 watts PEP on SSB; 160 watts on CW. 100 watts PEP (nominal) into 50 ohms. Carrier suppression -50 db; unwanted sideband -50 db; oscillator feedthrough and/or mixer products -50 db except 3500 kHz, 40 db. Second harmonic -40 db. Third order distortion -30 db. 40 db below single tone carrier. Within 100 Hz during any one hour period following a 20 minute warm-up. Not more than 100 Hz with 10% line voltage variation. 1 kHz after midband calibration. Not more than 50 Hz. 200 Hz on all bands. Variable, 50 ohms nominal, capable of matching up to 2:1 VSWR. Provision for monitoring keying in receiver. Sidetone level is adjustable. Grid block keying is free of chirps and clicks. Keyed carrier used for CW keying. Envelope rise and decay time adjustable. High impedance microphone or 312B-4,-5 phone patch. 300 - 2400 Hz nominal as determined by Mechanical Filter. ALC operates on IF and RF amplifiers and is capable of 10 db compression. Approximately 10 db of RF feedback around PA and driver for improved PA linearity. Primary fuses provided in the power supply to be used with the equipment. The PA cage is interlocked; the 6.3 v ac output is fused. SIZE: Transmitter with feet: 14 3/4" W, 7 3/4" H, 12 1/2" D (37.47 cm W, 19.69 cm H, 31.75 cm D).